The present article shall deal only with Fisheye images. More precisely images from so-called "circular" fisheyes. This is a complement to the first part that dealt with more common and conservative ways of shooting photographs to make panographies. On this article, I shall present results from more challenging situations to the stitching engines of both programs. are hurdles against which most stitching software may sometimes fail. I shall try to verify these points and evaluate the respective ability of Stitcher 5.5 Unilimited and PTGui 5.8 to cope with these rather difficult cases. The problem described above did not appear to be so obvious "in the past" due to commercial restriction in the first case and efficient manual preparation of stitching (PTOptimiser) in the other. Until less than a year ago, automatic stitching was still a remote idea for fisheye images at the least. One of the two competitors had elected to forego fisheyes and very wide angle lenses altogether and this relieved the "force-stitch" method that Realviz had managed to offer to a part of the panography making customers with evident success. In my opinion this is due to its reckognized "natural and intuitive workflow" that is easy to approach by not-technies people. 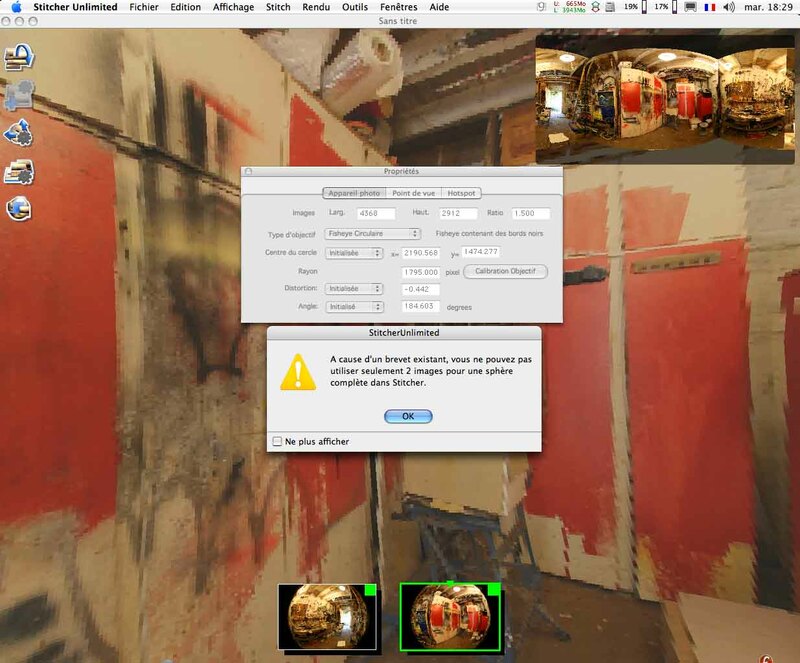 On the contrary, the second had been based on Panorama Tools that required some manual involvement by the user in the process (since the earliest automatic stitcher ever for fisheye images made by Pr Dersch had short lived in 1999). In this context and for some complementary reasons, it was thought that finding a way to take as less fisheye photographs as possible while still been able to cover the full sphere was the preferable way to go when sharpness, resolution and contrast were not the main driving factors. As an exemple, this way of doing allowed to make news action reporting possible on a really productive scale. 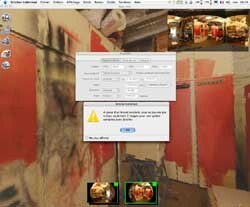 In September 2005, PTGui 5 was introduced with real integrated automatic fisheye images stitching ability and still associated with Panorama Tools, it offered another complementary powerful way to go. Some of the old users of Stitcher were tempted to make the switch as the just released Stitcher 5 was at last fitted with a "manual" process (with Control Points) to take care of difficult stitching situation, as well as an automatic stitching tool, but still not supporting fisheyes and very wide angle lenses images! Now, at end of July 2006, both Stitcher 5.5 Unlimited and PTGui 5.8 (PTGui 6 being in beta testing phase at the time of writing), have at last a similar range of stitching ability. My intention is to complete the Automatic Stitching (exclusively) engines comparison test. Since early 2006, an other compounding important factor has come in to play: the now famous "shaved" Nikkor 10,5 mm fisheye lens that can be adapted on a FF EOS product line of DSLR by Canon. This (shaving + adaptation) has uncovered an extraordinary set of optical characteristics that augment dramatically the above described challenge to the automatic stitching. Sigma 8 mm on an APS-c DSLR (Canon EOS 20D) camera. Six images were shot at 60 degrees interval, each with a roll angle of -34 degrees. From these 6 images (# 1, 2, 3, 4, 4, 5 and 6) two sets of 3 images (# 1, 3 and 5 and # 2, 4 and 6 resp.) shall be stitched successively. This is the only known way to cover the full sphere with only three photographs from a 8 mm fisheye on a reduced size sensor (r =1.5 or 1.6). I wrote an article (in french) on this subject. BTW: I and Luca Vascon have independently but simultaneously invented about this same concept. Personnal statement: For different reasons and especially since the release of PTGui 5, I use this method very rarely (understatement). My new current workflow is based on the Canon EOS 5D anyhow. No automatic stitch failure and no apparent large stitching error remaining after PTGui bending. Some minor errors in both Zenit and Nadir area could be very easily fixed. Same comment as the precedent case. The errors are seamigingly smaller in size at the Nadir but far too obvious in the Zenit area. Setting to "4" or "5" gave the "best" result as reported above. Setting to 6, 7 or 8 yielded NO more automatic stitched image at all, full stop! The Zenit has a slight stitching error that is not seen on the PTGui equivalent panography. Nikkor 10,5 mm on a Canon EOS 5D camera. Six images were shot at 60 degrees interval, Portrait mode. From these 6 images (# 1, 2, 3, 4, 4, 5 and 6) two sets of 3 images (# 1, 3 and 5 and # 2, 4 and 6 resp.) shall be stitched successively. If other ways to shot them could also do (*), this is the lowest number of shots to cover the full sphere with such a combo. (*) Two opposite images in Paysage mode at -22 degrees inclination/pitch + One Zenit is currently under investigation. It is (from "stitcher point of view"). But the Zenit as well as the Nadir exhibit obvious stitching errors. The very strong distortion of the lens near the circle borderline just seems to fool the automatic stitching engine. PTGui in the "Project Assistant" mode is not using all the resources for better refining stitching optimization that it would be able to. Simplicity means poor quality here. I would recommand to complement the first automatic pass by some better optimisation runs using more parameters and coefficients to better correct peripheral distortion of the lens. But the Zenit as well as the Nadir exhibit huge stitching errors. The very strong distortion of the lens near the circle borderline just seems to fool the automatic stitching engine. The straight lines are no longer straight in this critical areas. A lot of work in a graphic program is mandatory to get better result. Automatic stitching is not recommanded as a routine workflow for this case. Manual stitch may help. It is not possible to cover the full sphere that way. This test is intended to see how the stitcher and blenders will cope with strong distortion in overlap but this time in the equatorial region. Not much to comment here. The program produces apparently a satisfactory result. This is an expected side effect ot the limitation of the method: the polar regions -where would probably be most of the parallax induced stitching errors- are full black. Very obvious stitching errors that are so strong that Smart Blending cannot hide everything. These errors are of course differently situated in the two panoramas. The panography is just not good. Another way to stitch is required here than fully automatic mode. This test #3 (esp. the second item) seams to put ST 5.5 U in real difficulty whereas PTGui does an honorable job. This should be selected as a good specimen to be studied in detail later in order to investigate about the source cause of the difference. Six images were shot at 60 degrees interval, Landscape mode. From these 6 images (# 1, 2, 3, 4, 4, 5 and 6) one set of 2 images (# 1, 4) has been selected and subjected to automatic stitching test. As the Angular field HFOV of the circular images is about 194 degrees, one can assemble the two images to produce a full cylindrical (VFOV = 140 degrees) or an incomplete spherical 360x140 panorama. Nought: The program seems to look for a solution when one pushes the "Generate Control Points" button but it doesn't propose to "Create a panorama". The Panorama Editor stays still. Full stop. "TILT!" End of the game. Nought: The program seems to look for a solution when one pushes the "AutoStitch" button but it doesn't propose a resulting stitched image. "Because of an existing Patent, you are not allowed to use only 2 images for a complete sphere from Stitcher." I got a little tired by the end of this writing. Examining scrupulously dozens of panoramas of the same scene to look for deficiencies is a challenge for the present writer as it was initially for the stitching programs. Please do not hesitate to report deficiencies in my articles.